Lets Ride Bikes! 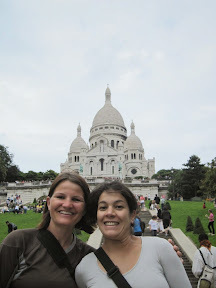 | Paris Day 6: Fun with French Friends! 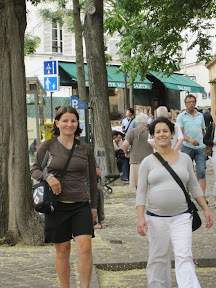 Paris Day 6: Fun with French Friends! Today Emmanuel and Nawal arrived from Dijon. We were very excited to have them visit. We were able to ride with Emmanuel for a week but we didn’t get to spend much time with Nawal so I was looking forward to that. We really just ended up walking around for hours checking out streets that were more for the locals that Andrew and I had not yet found. Nawal and I did some window shopping and then we decided to head to Montmarte to see the Sacre Couer church. 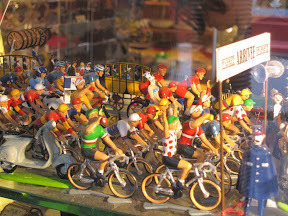 Again here we saw some of Paris that is for the locals. Very different vibe and experience. I was glad we did things we hadn’t yet seen. Again they were gracious tour guides. 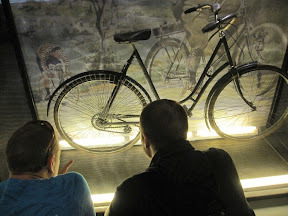 We went to a very cool bicycle exhibition at a museum. We also went into a library or as the French call it a biblioteque. There were loads of drawers for the dewy decimal cards and very few books. You still have to ask for the books from the basement. 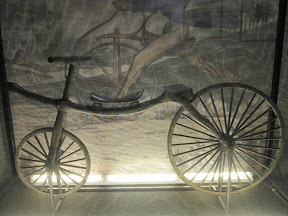 One of the first bicycle created. At that time they were called Hobby Horses. No chains, essentially just a run bike. Advertising for the first bikes. 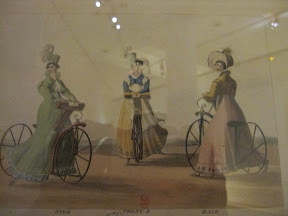 Back in it’s prime cycling was even fashionable for high classed women. Glad to see that trend coming back. Although this photo left me wondering if I should lose the spandex. 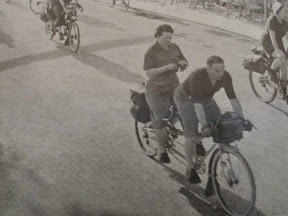 Even back then women on the back of the tandem bikes were on their BlackBerry! If you look closely she is knitting. 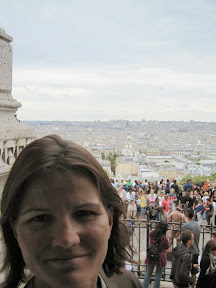 Looking up at the Sacre Couer. 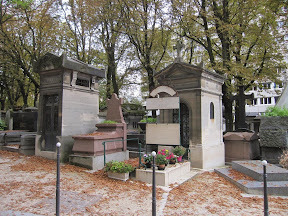 This is the cemetery where Jim Morrison is buried. Amazing tombstones for entire families, not just one person. We finished the night with a nice dinner and a few digestives. Today Nawal and Emmanuel arrived from Dijon! Amanda and I grabbed a crepe for breakfast and then walked to the nearby train station to meet their train. Having arrived without incident, Emmanuel proceeded to tour us around Paris. Mostly we wandered up and down streets, with no sense of direction since Emmanuel was lost. Every once and awhile he would shout and point at a non-descript building and try to explain that it was once a building of significance, but I think he was just making it up. Our tour took us to Centre George Pompidou (museum of modern art) where there were some street performers. There were a lot of crowds out on Saturday! We had a lovely spaghetti lunch, and Amanda and Nawal even went into a few shops to look at clothes. 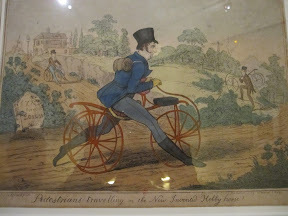 We also went on a pretty cool history of bicycles in France exhibition at the local library! Anyone able to figure out how this 2-speed worked? We mostly took the Metro to get us around, such as when we went from downtown, to Montmarte which is in the north of Paris. Montmarte is kind of run-down. 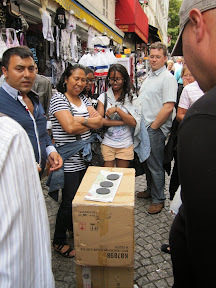 There were people selling black market or counterfeit goods (cigarettes, purses, sunglasses) and a half dozen games of 3-card Monty. Apparently no cameras allowed when con artists are at work! 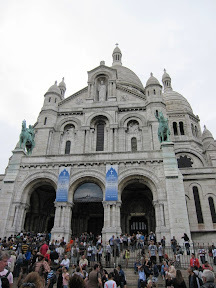 We walked up the big hill to the Basilica Sacre Couer. Again, very touristy but the neighborhood improved. I really enjoyed having coffee and looking down on Paris from the cafe. 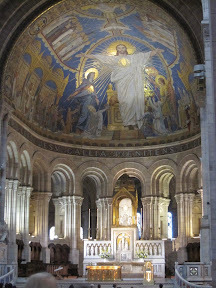 Inside Sacre Couer, no cameras allowed! Then we each went our respective ways to our hotels for “naptime”. After resting for a bit we headed back to the Rue de la Roquette which is sort of like Robson and Granville and Gastown all mixed into one. 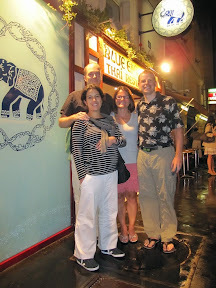 We had an aperitif and then went to a very nice Thai restaurant called the Blue Elephant. 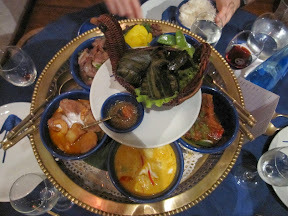 Amanda, Manu and I had the Royal Menu which included samples of a variety of dishes. Nawal had fish sticks. It was an incredible meal. Afterwards we went to a few different bars for digestif, but I think the best one is the Cafe des Anges which is right beside the hotel. Bedtime was around 0100, and we agreed to meet at 1100hrs for breakfast.